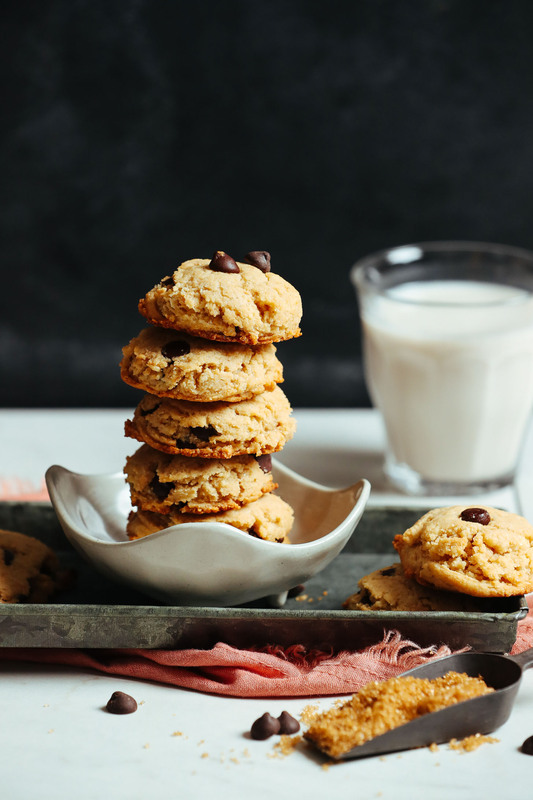 The other day, I was thinking through my rolodex of recipes and realized I don’t have a basic vegan gluten-free chocolate chip cookie on the blog. I KNOW. It’s just wrong. So, obviously, I had to fix that. The rest is history. Friends, ready your aprons and let’s bake! This 9-ingredient recipe starts with aquafaba! Yes, aquafaba knows no bounds. It acts as a binding and leavening agent in these cookies, which is kind of amazing. If you haven’t jumped on the aquafaba bandwagon yet (which is just the liquid from a can of chickpeas), you totally should! Don’t dump that liquid gold out next time you’re making hummus! It keeps in the fridge up to a week and makes so many delicious things (like oil-free granola!). 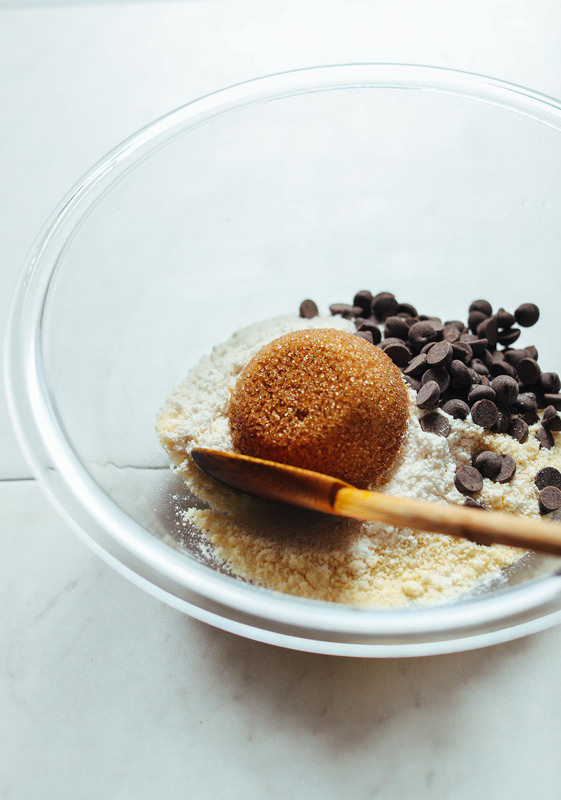 Next comes your dry ingredients, which are organic brown sugar, vegan dark chocolate chips, almond flour (which is key to keeping these light and tender), and our gluten-free flour blend. 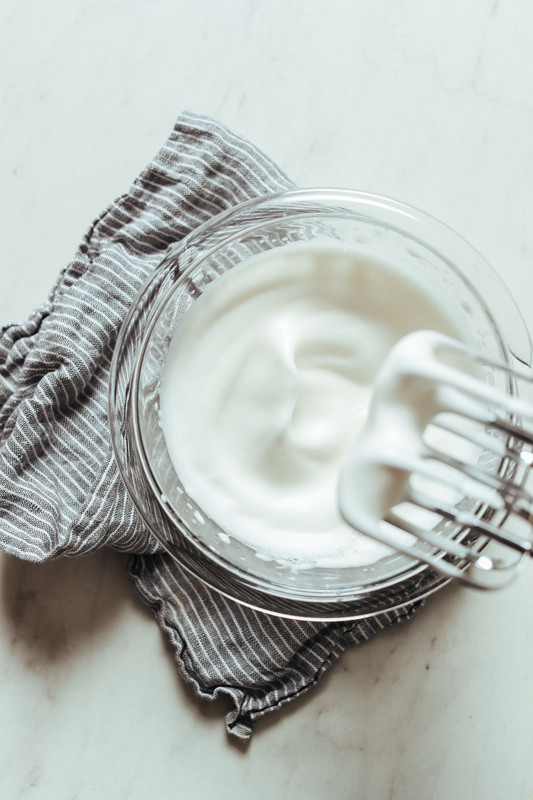 Add a little coconut oil and vanilla to your whipped aquafaba, combine with the dry ingredients, and you’re halfway there! These cookies benefit from a brief 30-minute chill before baking. But if you absolutely cannot wait (I mean, like you just can’t), march bravely onward toward baking. I just find they’re easier to work with (and bake better) when chilled. True story: When we shared these cookies with a friend, she had to hide them from her family because they didn’t trust themselves around the whole batch. Also, they said they were “undetectably” gluten-free. That’s a win in our book! Into cookies? Also check out our Healthy Oatmeal Chocolate Chip Cookies, Fudgy Vegan Brownie Cookies, 5-Ingredient Vegan Gluten-Free Cookies, and the Best Almond Meal Chocolate Chip Cookies! 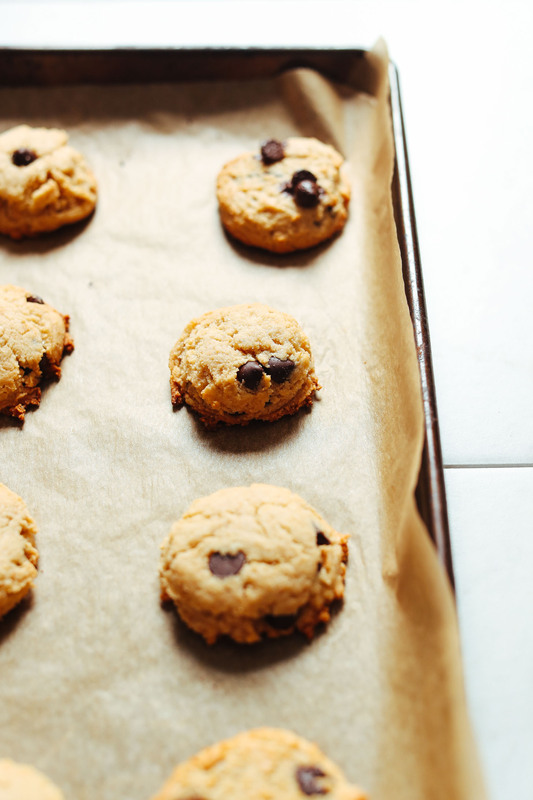 Perfect vegan chocolate chip cookies made with simple methods and 9 ingredients. Tender, sweet, studded with chocolate, and undetectably gluten-free. In a large mixing bowl, stir together almond flour, dark chocolate chips, gluten-free flour, baking powder, salt, and organic brown sugar. Set aside. To the aquafaba, add the melted coconut oil and vanilla and beat or whisk to combine. Then add to the dry ingredients and mix until just combined. You should have a firm, semi-tacky dough. Loosely cover and let chill in the refrigerator for 30 minutes. In the meantime, preheat oven to 375 degrees F (190 C) and line a baking sheet with parchment paper. Scoop out 1 1/2-Tablespoon amounts of dough (I like this scoop) and transfer to your lined baking sheet. Use the palm of your hand to smash the cookies down slightly into small mounds. They won’t spread much, so no need to leave a ton of room between cookies. There should be about 11 cookies (amount as original recipe is written // expect a different yield if altering batch size). Bake for 12-15 minutes or until the edges are golden brown. Be careful not to burn (especially on the bottoms). Remove from oven and let cool on the pan for 5 minutes. Then carefully loosen with a spatula and enjoy or continue to let cool. Store cooled leftovers in a sealed container at room temperature up to 4 days or 1 month in the freezer. These are super delicious when warm and dipped in almond milk or hot cocoa! *If avoiding nuts: try subbing a blend of oat flour, coconut flour, and ground flax or sesame seeds. Alternatively, we suspect the seed mixture called Superfood Burcha from Feel the Lean would be a nice substitution. Feel free to mix and match any of these seeds. If using large seeds (like pumpkin or sunflower seeds), give them a blitz in a blender or food processor or chop finely with a knife before using. We have not tested this idea - it is just a suggestion. *Recipe adapted from our Trail Mix Cookies, originally adapted from the Sprouted Kitchen cookbook. I have not made these cookies yet. My question is: can I make these w/o almond flour? I have coconut flour and was wondering if I could substitute? I think coconut flour requires some fiddling around with liquids? Not sure. Would appreciate any helpful comments. We wouldn’t recommend using just coconut flour, but you could us a blend of oat flour, coconut flour, and ground flax or sesame seeds. Hope that helps! Hi there! If you’re subbing the almond with the oat, coconut, and flax, what do you think the ratios would be? Would you divide 1 1/4 into thirds for equal amounts of the 3 subs for 1 1/4 cups total? Or a little less coconut flour and flax, and more oat? I can’t do almond at all. Thanks!! Hi Stephanie, we haven’t tried it, but would recommend equal amounts of each. Hope that helps! If you give it a try, we would love to hear how it goes! SO GOOD. I used half coconut sugar and half organic cane sugar, used Bob’s 1:1 flour, and used aquafaba that had been frozen before whipping. They are the best gluten free chocolate chip cookies I’ve made, vegan or not. Can this dough be left overnight in the frig? We haven’t tried that, but think it should work! Though the dough may be a little more firm than if only refrigerated for 30 minutes (due to the coconut oil). Hope that helps! If you give it a try, we would love to hear how it goes! These are the best dang cookies I’ve ever made! Everyone loved them. I suggest you make a double batch! Seriously my favorite cookie right now. I dont even understand how they taste so good… and cooking with the ashwaganda (bean water!) Is kind of a fun twist. Who knew?! I love learning these new tips! It did indeed work just fine. Can I substitute Arrow root for Potato starch? We haven’t tried ourselves and can’t say for sure, but if you experiment with it, report back on how it goes! Good luck! Can I substitute the brown sugar for dates? Made these today, and although the mixture seemed a bit crumbly, the end result was a delicious, soft on the inside, crunchy on the outside batch of cookies. I used chickpea flour for all the flour add ins, which is likely the reason for the crumbly batter…I just REALLY like chickpea flour in baking. Hehe. Once again, thank you for the recipe! Well the mix is chilling in the fridge but i’ve a feeling they’re going to fail! Adding the vanilla and oil to the aquafaba completely killed the peaks and turned it back to liquid. Then adding the dry ingredients resulted in a dry crumb that wouldn’t come together! Seemed like not enough moisture overall. I double checked quantities. Any tips or ideas where i might be going wrong? 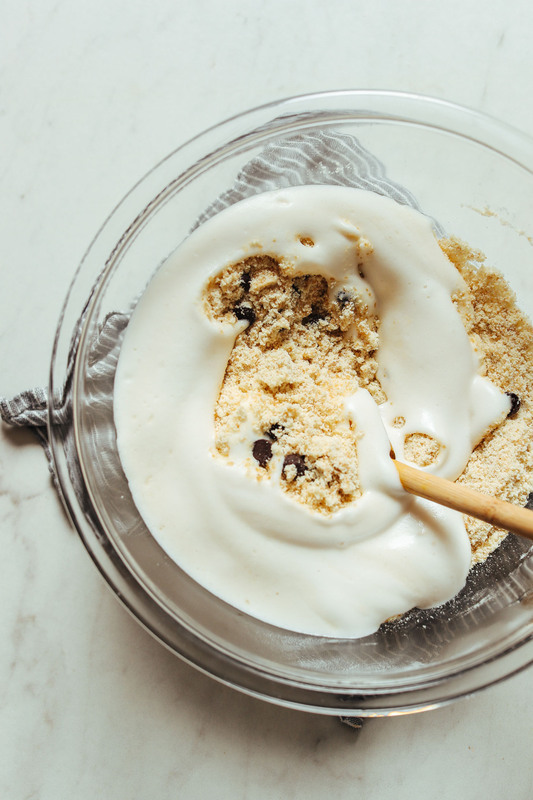 Hmm it sounds like there is not enough liquids in your cookie dough..in a pickle, you can always add a bit of non-dairy milk or more aquafaba and that should help but I’m not sure why its coming out dry in the first place. Hi Dana, these are a truly superb chocolate chip cookie! The substitutions I made were that I used a combination of coconut and sorghum flours in place of the almond flour, I used 2 Tbsp melted coconut oil and 1 Tbsp grapeseed oil instead of 3 Tbsp coconut oil I used coconut sugar in place of the organic brown sugar and added a bit more sweetener in the form of monk fruit sweetener, I doubled the chocolate chips (!) and since the dough was a bit dry I added some water to adjust the consistency. This recipe is very forgiving. I had to bake them longer than recommended as well. But they came out perfect and when kept in an airtight container they retained that just out of the oven consistency. 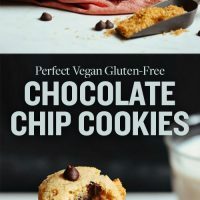 Love these and they are the best GF Vegan chocolate chip cookie I’ve ever made and I think they are an improvement over the classic ones which are so rich and greasy. I have a photo if you want me to post it. :) Thanks so much. These ROCK. Love your work! Yep — these are AH-MAZ-ING! I subbed the 1/3 cup of brown sugar for 2 TBSP + 2 tsps of Truvia® Brown Sugar Blend (stevia leaf) and these ended up being the perfect amount of sweet for my diabetic family members. I also added some pecans… you really can’t go wrong adding to these! Question for you: I love and use your GF Flour Blend often. A few family members are allergic/intolerant to Brown Rice. Do you have a recommendations for substitutions to Brown Rice Flour? We wouldn’t recommend using just coconut flour, but you could us a blend of oat flour, coconut flour, and ground flax or sesame seeds. Hi, this looks like an amazing recipe. Which flour do you thing is better to substitute the gluten-free flour blend: oat, chickpeas or regular flour? What can I use instead of almond flour? I’m nut free. I can’t wait to try! Thank you so much for this recipe! These gluten free cookie is delicate, moist and holds together well. To me, they do have strong coconut flavor. I might would half the coconut with vegan butter. Do you for see any issues with this? Hi Stanley! I think that should work! I used olive oil and they worked really well. Great! Thanks for sharing, Sonia! I made these and they were delicious, even though I forgot to whip the aquafaba! I was wondering if the coconut oil you use is the processed stuff that doesn’t really taste coconutty or the pressed stuff which does have a coconut flavour? thanks. These are the most delicious chocolate chip cookies ever!! I ate the entire batch myself within 2 days! So good. Thank you! Question – how long do you think the batter would last in the fridge/freezer? Because I can’t trust myself around a cooked batch, perhaps they could be made a few at a time. Hi Ange! We’re so glad you enjoyed these cookies. If you want to store the batter in the freezer, it will keep for up to 1 month. Here is a great resource that you may find helpful when freezing your dough! 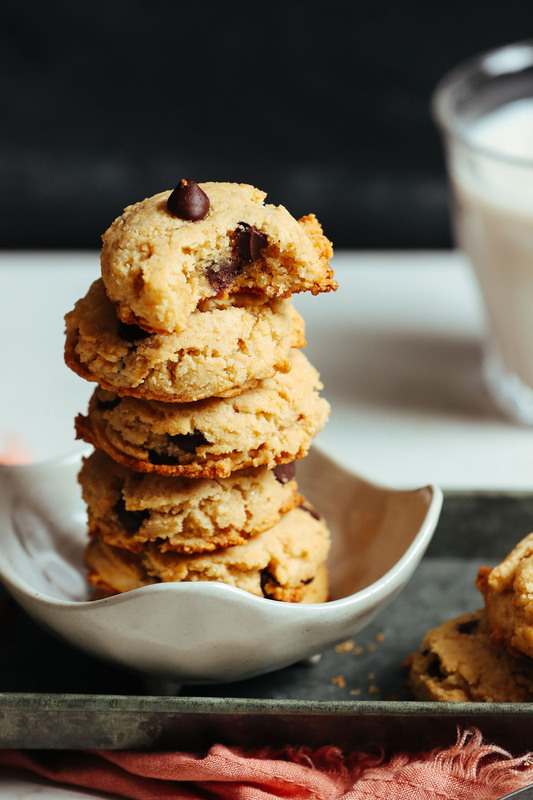 Your cookie recipes NEVER get old, even if they’re the most basic! Do you have a substitution for the oil in the recipe? We’re glad you enjoyed them, Cassie! In place of oil you could use a nut butter or applesauce instead. So first time writing a comment. :) I tried several of your reciepes and I love them. Especially all baking reciepes,.. This one, I tried several times in various ways, but the original with my messed up aquafaba was the best so far. by the way,.. aquqfaba everytime i mix the coconut oil to the fluffy beautifully mixed aquafaba, it kinda crumples up and just vanishes and becomes this wierd textured fluid with flocks of coconut.. I try it everytime and i just don’t get it the way you do.. so i sometimes just stir it around softly 1-2 times..
One time I tried the reciepe with only coconut flour: did not work at all! I doubled the recipe but otherwise followed it as written. These are absolutely fabulous!!! These will be our go-to cookies from now on. I may try to add some walnuts next time. Thanks for another great recipe! These are phenom! I didn’t have chocolate chips I subbed raisins. So good. SO delish! Definitely need a mixer to get soft peaks with the aquafaba, otherwise super easy. Could have baked them for longer but still so yummy. Next time I will double the recipe! I didn’t have any almond flour so I subbed for coconut flour like you mentioned in the notes. It was like saw dust and didn’t hold together. I ended up using a full cup of aquafaba and it just barely held together. During baking, it fell apart again. Any tips to make it work? These were pretty good. I am not sure if I baked them too long? I baked them for 16 minutes because the edges weren’t browning. They were kind of dry. I am gluten free but not vegan, is there anything I can do to make it more moist? Thank you again! Hi Jay! If your cookies come out dry and are not browning like they should, you’ve likely added too much flour. Better luck next time! Is there something I could add to preserve baked goods for longer, instead of freezing? I’m wanting to give out Christmas Cookies as presents to friends this year, but feel weird telling them they need to eat them in 3-4 days LOL Thank you so much! I’ve found that storing many of the baked goods from Dana in an airtight container in the fridge will extend the life of them by quite a bit. But even storing in the freezer isn’t as annoying as it seems — a quick zap in the microwave often brings them back to life just fine! I made this recipe twice! I don’t consider myself a baker. This was easy and super delicious! My husband, who’s an amateur gourmet cook, devoured them! I made them a batch with eggs and a batch with Egg Replacer. The batch with eggs was moister; the one with egg replacer was dryer. They were both equally delicious. I’m so grateful to my friend Leah who swears by your recipes and pointed me in your directions. I’m trying another recipe this week. 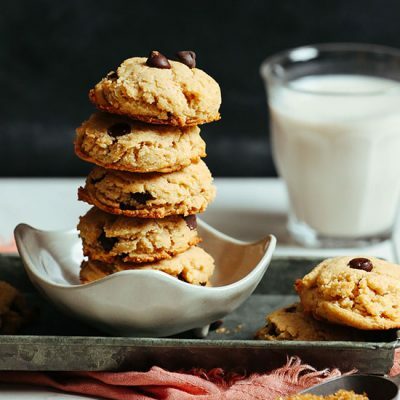 Thanks so much for sharing this recipe for healthy delicious cookies! So kind! Thanks for sharing, Alejandra! Doubled the recipe and subbed egg whites for aquafaba, and they turned out GREAT. Crisp but soft on the inside, perfectly sweet and chocolatey. Thanks for such a simple, delicious take on a classic cookie recipe. Hi, Florina! I think we were just having a server glitch. The page appears to be available now! Sorry for any inconvenience. There is no way to contact you that I can find but many of your links for older recipes are not working. Your 5 ingredient vegan peanut butter energy balls recipe is not accessible. I always make these when I got to a monthly get together and I can’t remember all the details – measurements- and my friends will be so disappointed if I don’t bring them. Help!! We had an issue we were resolving, but it should be fixed now! Refresh your browser and try again. Sorry for any inconvenience! I just made these cookies and they are just the best chocolate chip cookies I’ve ever made! I added a couple of tablespoons of sesame seeds and a little extra Aquafina and an extra tablespoon of coconut oil to balance moisture. Came out crisp on the outside and chewey on the inside and just delicious!! I also reduced sugar to 1/2 cup. Just perfect if you don’t like things too sweet. The flavor of almonds and sesame seeds stands out more. Dana does it again!! I’ve tried dozens of gf/v chocolate chip cookies and these are BY FAR my favorite!! They have the perfect texture–crisp on the outside and soft and pillowy on the inside and they don’t crumble or fall apart. Definitely gonna be my new go-to recipe. You’ve gotta try ’em! My daughter was specifically looking for a chewy on the inside, crisp on the outside chocolate chip cookie. We used egg whites instead of the aquafaba (she was worried to try it and we didn’t have enough almond flour to do two batches). They were amazing! Shared the recipe with my brother on FB. 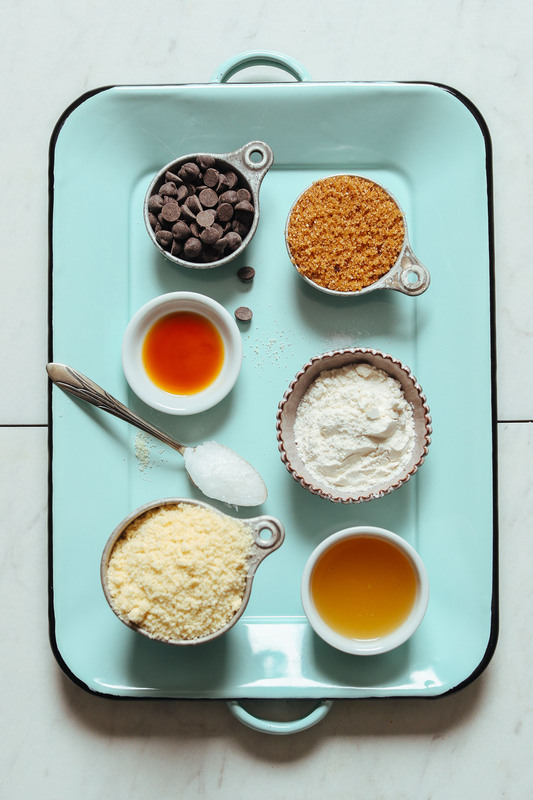 Could you substitute the brown sugar for something else? Perhaps maple syrup? I’d say a mix of coconut sugar and maple syrup would be best. Could I sub brown sugar for stevia/monkfruit sugar? and how much? Hmm, I think so, but it will affect the texture. Add more dry ingredients to compensate if needed. I made these and they were delicious. So easy and they looked like the picture and tasted amazing. These are so good!! And they turned out perfectly. I used regular flour instead of the gluten free flour. Yay! We’re so glad to hear that! Have you made these? I was wondering how they turned out for you in terms of texture, gf cookies I find tend to find quite dry. Hm, that was supposed to be a reply to someone who rated them but it hasn’t turned out that way. Oops! I don’t buy canned beans but rather cook my own. Will the liquid from by cooked beans work the same? It supposedly does, as long as it’s not too diluted. Can’t wait to try these . Who doesn’t crave cruelty free chocolate chip cookies 🍪I have just started vegan baking two months ago and love the results. I read about using Aquafaba from my first vegan cookbook Americas Test Kitchen “Vegan for Everybody” but flopped at first attempt. I’ll watch your video and get to baking. Hi! This recipe looks great. I haven’t done any Vegan baking yet so I’m not very familiar with the different flours. I have an almond allergy, is there another gluten free flour you would recommend? Thanks! I’d recommend half the amount in coconut flour OR another seed or grain flour, such as sunflower seed meal OR oat flour! Let us know if you give it a try. I’ve read that you can but I’ve never tried it! When I’ve used aquafaba for baking it gives the food an odd taste. Hmm, I’ve never experienced that. If there’s no sweetener involved it doesn’t taste great. But assuming you didn’t cut that out, I’m not sure what went wrong. Unless your aquafaba was spoiled? Loved and have followed your blog for a long time. So many of your recipes are using aquafaba now that many times I can’t make the recipe, which is sad because I’ve loved every single recipe of yours I’ve made! Is it possible for you to include a substitution recommendation for Aquafaba? (I’m vegan but I’m unfortunately allergic to all legumes except for lentils, soy and peanuts). For these cookies do you think a flaxseed egg would work? Thanks Dana! Oh shucks! Sorry, Kirianne. I’m not sure on vegan subs for aquafaba. It’s light, fluffy, and crisps up when baked. A flax egg would probably be the next best thing, but not perfect. Let us know if you give that a try! You could try something called Orgran Egg Replacer, it’s a powder mix so it last ages. It whips up like aquafaba! This recipe looks amazing! Unfortunately we don’t have any gluten-free flour, could I sub with regular flour instead? I think that should work. Let us know if you try it! I successfully use aquafaba from canned great northern beans as well! In fact, I’ve used that more than from chickpeas because we eat more of those. So, don’t be afraid to try other “bean juices”! Thanks for sharing! I have, however, heard that black beans aren’t a great option. Can we use regular flour in place of gluten free flour? I haven’t tried it, but that should work! If anyone tries (or if you have Dana) coconut sugar versus brown sugar, let me know how they turn out. These look super yummy and I am excited to try the recipe! Thank you!! I think both would work! Brown sugar is just more moist, as opposed to coconut sugar which is dry. So adjust your dough as needed! They look so good! Is there any way I could make this without aquafaba? Any alternatives? The only sub I know of is egg whites (which isn’t vegan friendly, of course, but should work as an alternative). Sure – you can sub the aquafaba with the same amount of egg whites. If we don’t have ingredients to make the gluten-free flour, is there a suggestion of a blend we can purchase that you think would work? Love your recipes!!! So pumped to make these. I am gonna try tonight! Hi Krystin! The best blend you can buy is probably Bob’s Red Mill 1:1 GF blend, OR the cup 4 cup blend. Good luck! If oil-free will applesauce work? I think so, but haven’t tested it. Try either applesauce or nut butter. If oil-free, can I sub with more aquafaba? These look fantastic! Hmm, I’d actually recommend trying a nut butter or applesauce instead. I totally haven’t jumped on the aquafaba bandwagon yet, but it seems like such an awesome ingredient & it is often so difficult to bind ingredients together in gluten free bakes. I can’t wait to give this a go, thanks so much for sharing!